Prospecting Web 3.0 - No More Cold Calling! There’s never been a better time to consider outsourcing the telephone prospecting function of your sales model. Always considered the domain of the B2B “inside sales” team. Even when economic and business conditions are good, it still makes no sense to build out an in-house inside sales team that’s tasked with handling inbound leads and making outbound prospecting calls. It’s simply more cost-effective and efficient to hire a professional business development firm to handle this activity to find new prospects. "Inside sales viewed from keeping this function in-house is dead". Business-to-business (B2B) teleprospecting is the act of phoning profiled, targeted individuals within organizations with the sole intent to engage the prospect and compel them to take a meeting based on their interest and qualification. Outsourced teleprospecting is gaining popularity as sales leaders and their bosses discover gaps in their selling processes that they can’t address internally. Their sales representatives are trying to balance prospecting and selling, with sacrifices to both. 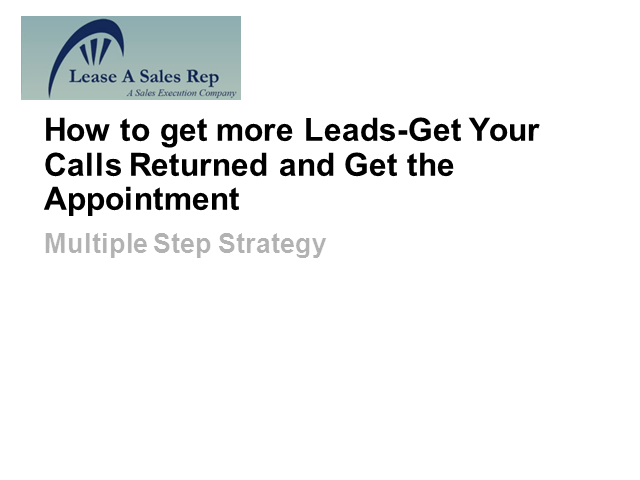 Join us as we share with you the latest social media technology, combined with our patented outbound prospecting methodology, and you'll leave absolutely convinced to Lease A Sales Rep for all your future prospecting needs. Don't miss this webcast. Title: Prospecting Web 3.0 - No More Cold Calling!